A cholera treatment centre in Haiti (December 2012). Secretary-General Ban Ki-moon has appointed renowned United States physician Paul Farmer to help galvanize support to eliminate cholera in Haiti, where the disease has already claimed over 7,750 lives. The naming of the Special Advisor for Community-Based Medicine and Lessons from Haiti comes just weeks after Mr. Ban launched a new initiative to help eliminate cholera in Haiti and the Dominican Republic, the two nations that make up the Caribbean island of Hispaniola. The initiative will invest in prevention, treatment, and education, and focus on the extension of clean drinking water and sanitation systems as well as the use of an oral vaccine to combat cholera, an acute intestinal infection caused by consuming contaminated food or water. Dr. Farmer served as the UN Deputy Special Envoy for Haiti from 2009 to 2012, during which he assisted in advancing the country’s economic and social development. He will use the data gathered from that experience to advise on lessons learned and how those can be applied in Haiti and other settings, according to the announcement of his appointment. He also brings a wealth of experience from his work at Harvard University, where he is the Chair of the Department of Global Health and Social Medicine, and Chief of the Division of Global Health Equity at Brigham and Women’s Hospital. He is also a founding director of Partners In Health, an international non-profit organization that provides direct health care services and undertakes research and advocacy activities on behalf of those who are sick and living in poverty. “He has pioneered novel community-based treatment strategies that successfully show that quality health care can be delivered in resource-poor settings,” the announcement stated. 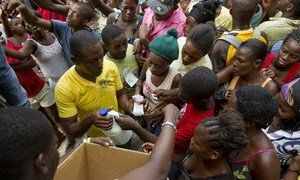 The United Nations today announced a new initiative to help eliminate cholera in Haiti and the Dominican Republic, the two nations that make up the Caribbean island of Hispaniola.